Comments: James Benson Tindall was born on February 21, 1877, near Centenary, Buckingham County, Virginia. He was the son of a farmer, Thomas Tindall (1830-1902), and his wife, Martha Stinson (1846-1906). Jim attended Buckingham Country schools, and, in 1895, he met 5-yr. old Mary Tapscott, a neighbor, who lived half a mile from the Tindalls' Buckingham home. Obviously quite taken with young Mary, it was not long before Jim declared that he intended to 'wait for her' to grow up. By 1898, Jim moved to Richmond with one of his brothers to work at a locomotive works where he was employed until 1906. In 1906, Jim moved to Hatton, a small transportation center and trading stop located a few miles outside Scottsville on Rt. 625. At that time, Edwin and Cora (Brown) Raine managed Hatton Ferry, Hatton Station on the C&O Railway, Brown's store, and the Hatton Post Office, located just inside the store's front door. Although lacking prior store management experience, Jim rented Brown's Store from the Raines and began intensive on-the-job training with Eugene Layne, an old Buckingham friend who became his business partner. 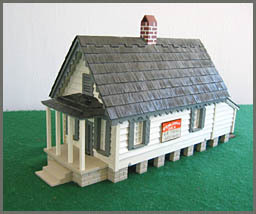 Jim renamed the store, J.B. Tindall Groceries, and lived in a small cottage between the store and the railroad tracks. On March 24, 1909, James B. Tindall was appointed Postmaster of Hatton, by Frank H. Hitchcock, the Postmaster General of the United States of America. Jim would remain Hatton's postmaster for 36 years until his death in 1945. 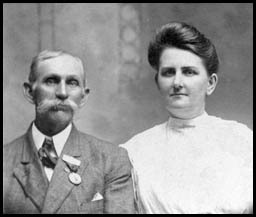 Jim's descendants today often wonder if he didn't move to Hatton in 1906 to be closer to Miss Mary Alice Tapscott, who was growing up nicely just across the James River in Buckingham County. Mary was born on September 7, 1890, near Centenary, Buckingham County, Virginia, and was the daughter of George Allen Tapscott (1850-1935) and his second wife, Katie E. Norvell (1870-1928). The photo at right is one taken about 1914 of George and Katie Tapscott. George was a veteran of the 56th Virginia Infantry, and after the Civil War, he worked as a surveyor and notary public in Albemarle County. 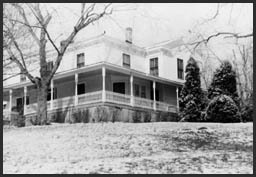 His daughter, Mary attended a small country school not far from the Tapscott and Tindall homes in Buckingham County. On September 7, 1914, G.A. Tapscott purchased the Raines' home on a hill overlooking the J.B. Tindall Groceries store and 104.6 acres of Raines' farm land surrounding the Hatton business center for $2000. On the same date for $4000, the Raines family sold Jim Tindall the Hatton Station, J.B. Tindall Groceries, Hatton Ferry, the landing on both sides of the river, and all ferry boats, lines, and oars. Also included in the sale were 4-5 acres of land surrounding the station, store, and landing area. When Eugene Layne left the partnership to farm in 1916, Jim's older brother, Lewis Tindall, became his assistant +in the Hatton operations. Together Jim and Lewis managed the Hatton ferry, train station, timber, and store operations until 1944. By 1914, Jim was a very respectable businessman, and Miss Mary had grown to a marriageable age. 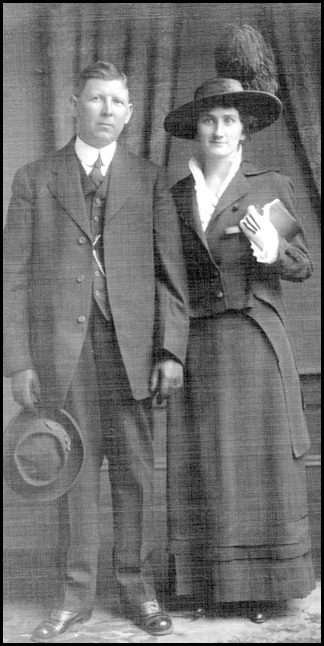 James married Mary Tapscott on November 4, 1914, and they are shown in the photo above as they were about to catch a train at Hatton Station for their wedding trip. After they returned from their honeymoon, the Tindalls moved in with Mary's parents, George and Katie Tapscott, in their big home on the hill behind the Tindall store. After a short while, Jim and Mary decided to buy a store in Orange County, Virginia, and move there. When they told Mary's parents, the Tapscotts were devastated and urged them to stay at Hatton with them. Jim told his father-in-law, "I don't know if I can live in another man's home." George responded, "Well, I can!" and sold his home to the Tindalls. Mary's parents lived with the Tindalls at Hatton for the rest of their lives. 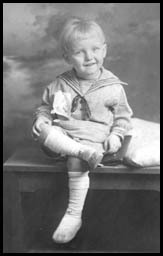 (1) James Benson Tindall, Jr., born Oct. 17, 1915, at the Tindalls' house in Hatton. His Uncle George Tapscott rode up the railroad tracks to Scottsville to bring Dr. Percy Harris to help with the delivery. Dr. Harris rode on his horse back up the tracks and delivered Jim, Jr. Jim attended a one room school about half a mile from his Hatton home through the sixth grade, and then finished his education at Scottsville School. When he was in the seventh grade (1927), Grandmother Katie Tapscott drove him to Scottsville School in a buggy. She stayed at Etta Harris' millinery in town until it was time to pick her grandson up at school and drive him back to Hatton. Jim was the oldest Tindall grandchild and a great favorite of his Grandmother Tapscott. His sisters claim that all of the family photos are of Jim, the oldest grandchild Grandmother Tapscott had. The Tindall children never went swimming in the James River because there were many deep holes in the river near Hatton, and it was too dangerous for the children's swimming. At age 14 years, Jim says that he built a pond about 4 ft. wide by building a dam to trap some water. The children splashed in that pond until one day Jim sat down on the bank to take his shoes off before going into the water. A big snake wiggled off the bank nearby and went into the water. According to Jim, that was the LAST time the Tindall children went swimming there! James Benson Tindall, Jr. was married twice: (1) Francis de Berry on September 24, 1941. Francis was a popular first grade teacher at Scottsville; she died circa 1971. James married (2) Bickie Martin on March 1, 1974. After graduating from high school, Jim worked at Hatton with his father to manage the store, railway station, ferry, and timber business. When his father died in 1945, Jim, Jr., took over full responsibility for the various Tindall businesses at Hatton, and was appointed postmaster of Hatton, too. 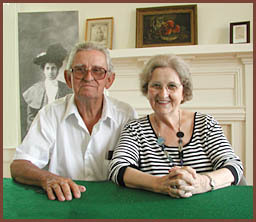 In February 1975, Jim retired and and currently lives in Scottsville with his wife, Bickie. (2) Mary Elizabeth Tindall, born November 2, 1919, at the family home in Hatton. Elizabeth graduated from Scottsville School, driven there each day by her brother, Jim. Then she attended Longwood College in Farmville. Jim Tindall took Elizabeth over to Longwood each Sunday night to take her to school, and brought her home again each Friday night. Jim met his first wife, Francis de Berry, who was Elizabeth's classmate at Longwood. Jim and Francis married in 1941, and Francis became like a big sister to Jim's youngest sister, Gin. Elizabeth graduated from Longwood College and became a high school teacher in Richmond. She married Billy Duncan, and they have two sons: one son lives in Georgia; the other son, James Tindall Duncan, lives in Richmond. Elizabeth died in Richmond, VA, on January 5, 1998. (3) Katheryne L. Tindall, born December 10, 1924, at the family home in Hatton. Katheryne graduated from Scottsville School and attended Longwood College in Farmville. She became a teacher and taught in Front Royal, Virginia, and in Scottsville. In July 1953, Katheryne married Dr. Louis Hundley, a professor at Virginia Military Institute in Lexington, VA. During their courtship, Louis rode his 125 cc motorcycle from Blacksburg to Hatton to see Katheryne. Katheryne and Louis have one daughter, Mary Louise Hunt, who lives in Yorktown, Virginia, in 2007. (4) Virginia 'Gin' Lewis Tindall, born July 4, 1927, at the family home in Hatton. She said that as a child she thought it quite nice that America celebrated her birthday every year. Gin was an acccomplished pianist and from age 8, she accompanied most school events such as the May Day programs, Baccalaureate, and assemblies. She also played the piano for background music during movies at Victory Theater. Gin graduated from Scottsville School and attended Longwood College in Farmville. She became a teacher and later the principal at Walter Reed Elementary School, Arlington, Virginia. Gin married Thomas Schilder on August 18, 1960, and the Schilders are the parents of one son, Thomas Schilder, Jr., born July 1, 1963. Gin retired from teaching in 1963 with the birth of her son. In 2004, Gin and Tom Schilder reside in McLean, Virginia; their son lives nearby. Katheryne (Tindall) Hundley, and James Benson Tindall, Jr.
Jim's son remembers his father as quite a gentleman, who was outgoing and got along well with everyone. Friends, customers, drummers, railroad men, and even Jim's older brothers called him 'Judge,' a nickname that he earned as a young boy. After accompanying his father, Tom Tindall, to the courthouse for a board of supervisor's meeting, Jim marveled at the judge sitting at his bench and hitting his gavel on it emphatically. John went home, got a box, and started thumping on it as he'd seen judges do. The majority of people, who knew him well, called him 'Judge' throughout his life. Jim Tindall's work as merchant, station agent, ferry manager, timberman, and post master left him little free time. He worked from sunup to sundown six days a week. Sundays were church days for the Tindalls, and once a month, Jim would take his family over to Buckingham to visit his brothers and sisters. Another Sunday afternoon a month, they would visit Mary's siblings. His son remembers that his father once went squirrel hunting, but usually there was plenty of work to be done to keep up with all the business that happened at Hatton six days a week. Jim's children say that their father rarely disciplined them. But Jim, Jr. recalls one night when he and his sister were doing dishes and started to fuss at each other. Their father came into the kitchen with a paper rolled up in his hand and swatted his son gently once or twice. Jim, Jr., turned to his dad, who was holding the Methodist Advocate and said, "Daddy, you hit me with the church paper!" His father looked down at the Advocate in his hand, started laughing, and departed the kitchen. Mary Tindall was an excellent seamstress and gardener and supervised a cook/housekeeper in the Tindall home. One day in rainy weather, Mary looked all around the house for her four-year old son, Jim. When she couldn't find him in the house, she called down to the store to ask if anyone had seen the boy. His Uncle Lewis looked all over the store, but there was no trace of Jim, Jr. Finally Mary discovered her son in a chair, where he was hiding quite effectively under a bunch of pillows. His mother was so happy to see him, she couldn't be mad. In later years, when Jim, Jr., was a young adult, his mother never went to sleep until he came home. A few times he remembers getting home an hour or so before she realized she'd not heard him come in. Invariably she'd get up to check Jim's room -- as Jim, Jr., says, "Mom still worried about me even when I was grown." James Benson Tindall, Sr., died unexpectedly of a kidney condition on January 3, 1945, in a Charlottesville hospital, and is buried at Centenary United Methodist Church Cemetery. His wife, Mary, came down to the store to help her son with the heavy workload. Mary Alice (Tapscott) Tindall died on September 2, 1976, in Charlottesville and is buried beside her husband at Centenary Cemetery. 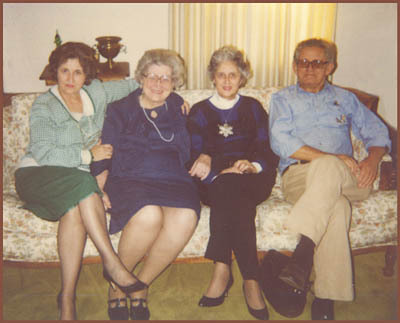 Katherine M. Ellis, October 30, 2004: "I have a very vivid recollection of a visit that I made to the Tindall's home when I was a very young child. Since I was born on February 20, 1924, and Kathryne Tindall was born on December 10, 1924, she must have been the one that was my friend. I remember being fascinated with the river and the little store down the field from the Tindall's lovely big house with the porch all around." "Mrs. Tindall and my mother, Helen Harris, were friends -- so that's how I got to know the Tindalls." "There were some little boys across the river -- probably cousins -- and for some reason we were trying to throw rocks over the river at them. Of course the rocks never made it across the river!" "After I finished the first grade in Scottsville, we moved to Charlottesville; so this visit took place many, many years ago." Connie Adcock Knight, October 08, 2005: "I grew up in the Hatton Ferry area. Tindall's store was the most precious memory of my childhood. As youngsters, my older sister, Joyce, and my brother, Melvin, would save drink bottles, and then we would take the empty bottles to Tindalls and would get cash for them. Then we would divide the money between the three of us. We would either buy ice cream, a candy bar, or a soda at the store. As we grew up, we would ride bikes or even walk to the store on a Saturday afternoon. It was safe to do that, then." "I truly, truly miss those days especially the warmth and humor that Mr. Tindall, Jr., expressed. I also wish for those times for my kids that they will never experience in their lives because the world is not a safe place like it was then." The above photos of the Tindall family are part of the collections of James Benson Tindall, Jr., and Virginia (Tindall) Schilder. In 2001, James resided in Scottsville, and Virginia lived in McLean, Virginia; both are now deceased. They were the children of James Benson and Mary Alice (Tapscott) Tindall.